Today's project has a story that I feel I must share prior to the layout. Ever since my first Halloween, as a mother, I wanted nothing more than to make costumes for my son, I was very lucky that my first born wanted nothing more than his mother to make his costumes...even now at 24 I still help him conjure up his next costume and I love it. Enter my 3 youngest....all they ever wanted was store bought costumes. I begged them for years to let me make their costumes, I even pulled out the pictures from all the years that I made their big brothers. It didn't matter, they wanted store bought...that is until 2009! Brycen came home from school one day and told me he wanted me to make him a costume, he wanted to be a chicken for Halloween. I was pumped and instantly started thinking of ideas on how to make him the best chicken this city as ever seen. We are from Salem after all. ;) Then like a miracle my daughter came to me and asked me to make her a dead bride! I was in heaven! I then begged my youngest son, Trevor, if I could make him a costume. I was gluing feather's on Brycen's chicken costume at the time and he was trying to figure out what he should be...Brycen walked by and said "the egg". Then they had the debate about what came first. Brycen thinks the chicken and Trevor thinks the egg and hence a complete Halloween set was born. The kids got stopped at just about every house that night because people wanted to take their picture. My 76 yr old neighbor made me promise that I would send the pictures of them into the Salem Gazette. I did and they published them. My children were so excited to be in the paper and I was so proud of the costumes that I made them. Last year when I opened the Gazette to see what the Haunted Happenings schedule was for October I was stunned to see that they had used the picture of the boys again to announce the Happenings for Salem. The boys were doubly thrilled and now it's a tradition for me to make their costumes. I put a folder on this card (my daughter's photo is mounted on the front of it) to hold the newspaper clippings for them. They stayed on the refrigerator for over a year. 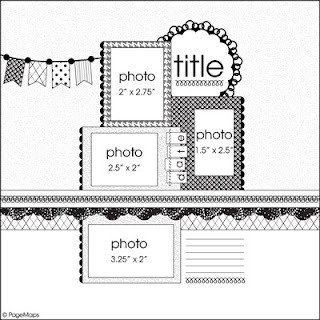 I used this sketch from Scrapbook & Cards Today. I love sketches and try to use them as often as I can. I usually only use them for photo placement and then design around them but I loved this sketch. Loved it!!!! Becky Fleck just has a knack for making these sketches. I sprained my ankle and tore the ligaments in it yesterday by falling down the stairs and I am bed bound. So there is no creating for me for a few days. I have a wonderful guest coming by tomorrow. She is one of my favorite card makers ever and I know you are going to LOVE her!!! what a great mama you are! those costumes are amazing! What a sweet story!!! You GO MOM!!!!!!! Good luck with your ankle! !